Most major medical research funders are still failing to curb research waste, slowing down medical progress and threatening the attainment of several of the Sustainable Development Goals’ health targets, a new study shows. Published in JAMA in April 2018, the study led by Nicholas DeVito of the University of Oxford shows that many of the world’s largest public and philanthropic funders have failed to put into place basic safeguards to ensure that the results of the clinical trials they fund contribute to scientific progress and global health, with public funders in China, France, Italy, and Spain performing particularly poorly. Around half of all clinical trials conducted worldwide do not report their results, and hence make no contribution whatsoever to the global search for new treatments and cures. As a result, an estimated $85 billion invested into medical research go to waste every year. For example, a recent search of the U.S. government run registry Clinicaltrials.gov conducted by TranspariMED identified 494 completed clinical trials of potential vaccines for HIV, tuberculosis and malaria. Out of those, 82% had not posted summary results onto the registry, contrary to best practices set out by the World Health Organization. The proportion of these trials that have additionally failed to publish results in the academic literature is unknown. 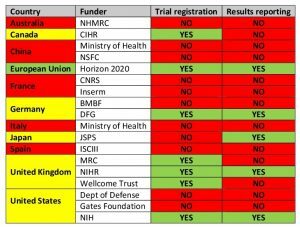 Only four of the twenty top funders, Britain’s National Institute for Health Research (NIHR), Germany’s Deutsche Forschungsgemeinschaft (DFG), the European Union’s Horizon 2020 programme, and the United States’ National Institutes of Health (NIH), earned full marks for demanding that all trials they fund are registered and their results reported, and for ensuring grantees’ compliance with these rules through audits. In contrast, public research funders in China, France (CNRS and Inserm), Italy (Ministry of Health), and Spain (ISCIII) had not even put related policies onto paper, let alone taken steps to ensure that they were followed in practice. Which Funders Ensure that Clinical Trials are Registered and Reported? Note: A funder is counted as ensuring that trials are registered and/or reported only if it has a relevant policy and audits grantees’ compliance. Table adapted from DeVito et al (2018). Countries highlighted in yellow have a mixed performance. The performance of major philanthropic funders was also disappointing. At the time they were assessed, in spring 2017, neither the Gates Foundation nor the Wellcome Trust required their grantees to share the results of their research. Both organizations have since pledged to strengthen their policies and conduct regular audits of their grantees’ performance. Clinical trials are the cornerstone of modern medicine. The negative effects of incomplete registration and reporting of clinical trials go far beyond the wasteful duplication of research efforts. For example, it can leave potential harms undetected; over 100,000 patient deaths in the United States alone have been directly linked to weak clinical trial transparency. Opacity in clinical trials also slows down the discovery of new treatments and cures. In West Africa, efforts to contain the Ebola epidemic foundered because the results of many Ebola trials remained unknown. Unless research funders fix the system and speed up results sharing, the Sustainable Development Goals’ targets of supporting the development of new vaccines and medicines, and of ending the epidemics of AIDS, tuberculosis, malaria and neglected tropical diseases by 2030, are unlikely to be achieved. In addition, selective reporting of trial results tends to make new and more expensive drugs look more effective than cheaper generic alternatives, leading to the misallocation of scarce public health funds, including in developing countries. For example, governments worldwide spent billions on the drug Tamiflu based on partial trial data, only to discover later that the drug was largely ineffective. Clearly, the Sustainable Development Goals’ target of “access to safe, effective, quality and affordable essential medicines and vaccines for all” cannot be achieved as long as health officials cannot even determine whether a given drug is safe or effective, let alone whether it is cost-effective compared to other treatments. As the transparency pioneers in Britain, Germany and the United States demonstrate, this is entirely feasible. 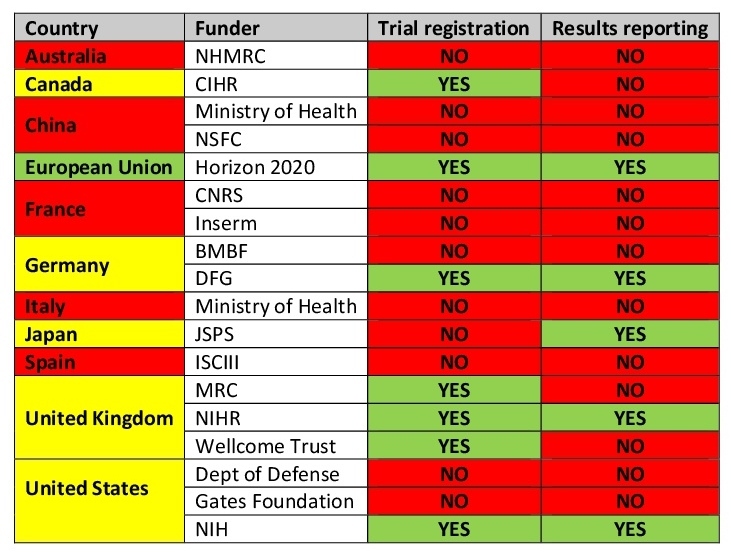 The next step will be for global health advocates, scientists and taxpayers in Australia, China, France, Italy, and Spain to ask their politicians why they are still allowing public funds to be wasted on clinical trials that fail to adhere to global transparency norms. Till Bruckner (tillbruckner@gmail.com) is the founder of TranspariMED, a campaign that works to end evidence distortion in medicine. He previously worked for the AllTrials campaign and the anti-corruption group Transparency International. He remains active with Transparify, an initiative to promote transparency and integrity in policy research and advocacy. In his previous life, he worked in international development, occupying both field and research roles. Till holds a PhD in political science from the University of Bristol, U.K.